The ultimate goal of our spiritual quest is Enlightenment, that is what we all wish to achieve. Enlightenment is not a remote state of Consciousness that we need to achieve some time in the future, but it is the very heart of our nature. Our spiritual quest diverts our attention to that imaginary, future state of Consciousness that we believe to be enlightenment. In this way, the spiritual quest detaches and diverts us from our true nature, enlightenment. We are therefore unable to ever reach enlightenment through the process of spiritual quest. Enlightenment is, as we can now see, our true, inner nature. But what is in our true, inner nature? Unfortunately, during our spiritual search, most of us have been alienated from it; so much so, that we have even forgotten about it. It is, however, permanently present in our life, but we simply disregard it. Our attention is always engaged by something, something that we need to deal with, so we very rarely take the trouble of looking into ourself. Still, if we were able to concentrate our attention on ourselves, that brief moment of alert Consciousness would be enough for us to recognize that the alert Consciousness, free of emotions and thoughts is our true inner nature. We are now enlightened, we have never been anything else. The question now arise, where that enlightenment, that alert consciousness has disappeared from our life? As children, playing free of problems, we live in the present moment, in the state of alert Consciousness (so if we wish to meet an enlightened human being, all we need to do is go out to the nearest playground). Then, carefree playing was replaced by more serious things in our life. From our parents we learned who we are and what our mission in life is. We were told that we are young human beings, still in the process of developing and shaping, and becoming an adult is a hard work. Carefree playing was gradually replaced by purpose-oriented work in our life. Our teachers and parents therefore taught as how to set up objectives, how to make plans, and we soon learned that future is more important for us than present. We then concentrated out attention from the vividness of the present moment onto the image our parents and teachers created in us, onto the image we need to become one day. Simultaneously with that process, the impression that we are not what we are supposed to be emerged gradually in our mind. As children we simply had no choice, we had to accept the process, we had to identify with the new image. We are therefore moving away from our own inner nature, under the hypnotic attraction of a future goal to be achieved later. It is thus understandable that we look upon enlightenment as a goal to be achieved in the future. Spurred by our ambitions, we pursue various goals all through our lives. Our whole life is a rush. We chase our desires and unfulfilled dreams. We are attracted by money, power, prestige, a wholesome, happy life. We aspire for something all the time, we always want to achieve something. This restless rush is instigated by our fear that we are still not what we want to be. We are never satisfied, we always want something else, we would like to be better, more beautiful, richer than we are at present. Everybody nurtures an idealized image of what he/she would like to be like. The mind projects this idealized image into the future, and reveals the way leading to it. But this image requires a constant rush, stress, anxiety and worry in our life, as nothing is free, we have to struggle to achieve our goals. But this is not our own personal tragedy, but that of the entire mankind. Generation after generation is conditioned to that attitude by the preceding generations. It is a vicious circle, and breaking out of it is almost impossible. During our spiritual journey we must recognize this process, and we must realize that we no longer need to become something new, as we are all in possession of all the qualities that we have been pursuing so far in our dreams. We must make efforts to be present at every moment of our life. That Presence shall bring alert Consciousness back to our life. In the state of alert Consciousness thoughts will no longer keep our attention in captivity, and we may experience silence. In the alert silence we recognize that it is our real Self is, it is our real inner nature. Enlightenment is us, we ourselves. From the book The Revolution of Consciousness: Deconditioning the Programmed Mind. 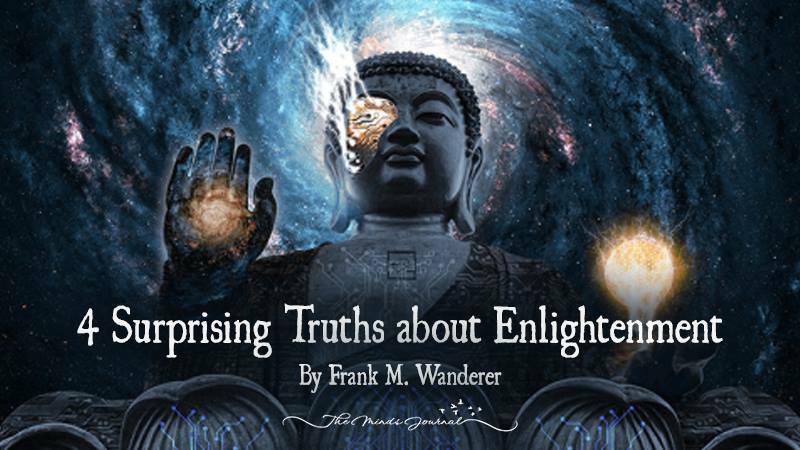 Frank M. Wanderer Ph.D is a professor of psychology, a consciousness researcher and writer. Frank is the author of the books &amp;bdquo;The Revolution of Consciousness: Deconditioning the Programmed Mind and several books on consciousness. With a lifelong interest in the mystery of human existence, Frank&amp;rsquo;s work is to help others wake up from identification with our personal history and the illusory world of the forms and shapes, and to find our true Self.